He Will Come Again is a thoroughly modernized revision of the Victorian classic, He Will Come, by Stephen H. Tyng Jr. D.D.. Tyng's systematic eschatology is now an easy to read end-times study that will strengthen and encourage anyone who earnestly awaits the return of our Lord Jesus Christ. We are strengthened with hope when we trust in the promised return of the Lord Jesus Christ. He said, "I go to prepare a place for you. And if I go and prepare a place for you, I will come again and receive you to Myself; that where I am, there you may be also" (John 14: 2-3). Here is irrefutable scriptural support for a Dispensational, Pre-Millennial and Pre-Tribulation Rapture theology. Tyng expresses the glorious appearing of Jesus Christ as truly glorious. It is to our great misfortune that this tone is rarely preached in American pulpits today. Tyng reminds us of the glorious majesty that is our God and Savior Jesus Christ. 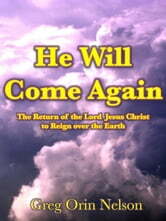 Christ Will Return – But Then What? Who Will Despise: The Day of Small Things?